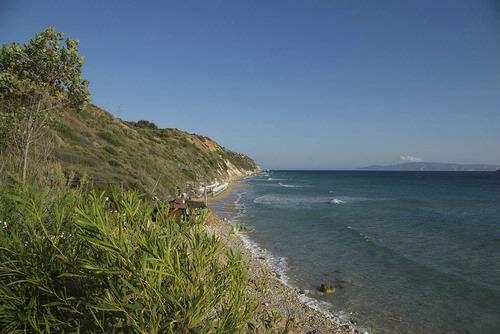 The beach of Avithos is near Svoronata and has a beach bar and taverna. Svoronata is a scattered village that is within easy reach of Argostoli and the airport. It has a good selection of accommodation including a hotel; private villas (many with private swimming pools), apartments and rooms to rent. There a number of bars, tavernas and restaurants scattered throughout the village and a number of mini markets. There a number of good beaches in the area, including Bahia Minia, Bahia Ames and Bahia Avithos. A new marina is being built at Aghia Pelagias. The nearby pretty hill villages of Domata and Kourkoumelata are worth visiting, not least because of the spectacular views over the south west coastline of Kefalonia as well as offering a genuine slice of rustic Greek charm.